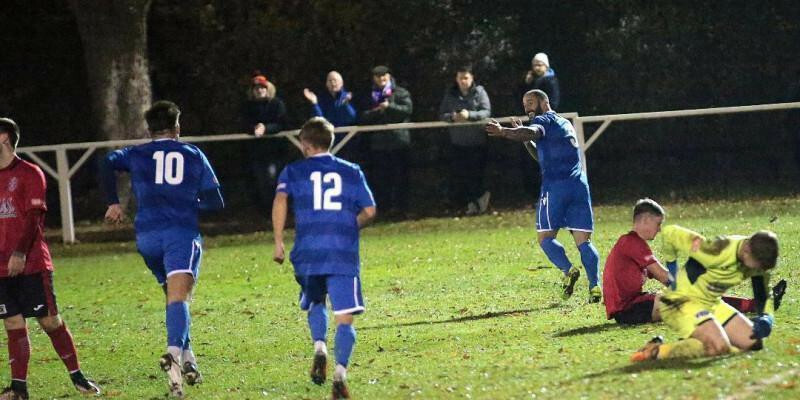 Supermarine ended their losing streak last night to register their first win in four games as they came from behind to beat near neighbours Highworth Town in the Wiltshire Senior Cup. Both teams sights needed zeroing in the first half of this game. After an early spell of pressure from the away team, Connor Thompson, Stuart Fleetwood and Dave Bampton all hit efforts over the bar before Ryan Campbell eventually found the target, stinging the palms of former Supermarine ’keeper Connor Johns with a rasping effort from 18-yards after 12 minutes. Another former ‘Marine man, (it’s probably easier to identify the players at Highworth who don’t have Supermarine connections) Ash Edenborough failed to hit the target when well placed inside the penalty area as he dragged a left footed effort wide of the near post. Tom Cole then fired over the bar when the ball dropped to him from a corner. It was five minutes before half-time when the games first real talking point came as Dan Williamson went down in agony after falling awkwardly from a challenge. Visibly and audibly in pain straight away, treatment was administered quickly by physio’s from both teams and eventually the right back was able to get to his feet and be helped off the pitch clutching his left shoulder. It was later confirmed that he had dislocated his shoulder and went to the Great Western Hospital for X-Rays and treatment where it was put back into place. The injury will come as a blow as Dan had been in fine form through the last few games and everybody at Supermarine wishes him well and a speedy recovery and look forward to seeing you back soon. After the lengthy delay was over Lee Spalding’s men twice went close again as Campbell hit an effort that deflected into the grateful arms of Johns before Bampton saw his header from a corner blocked on the line. The second half’s first chance resulted in a goal. It was another long ball that caught the defence out and the lively Toumani Sidibi slotted home. Immediately from kick-off, Thompson saw an effort hit the post and roll across the line and out to safety that Johns just about got a touch on which proved crucial. Johns was again on hand to deny his former team, firstly parrying a Brad Hooper effort out for a corner before denying a Conor McDonagh effort that looked to be heading in. Sidibi then went close for Jeff Roberts’ men as he brought the first real save of the game out of Swindon Town loanee Will Henry before Johns was once again played spoiler, this time denying substitute Joe Selman who had earlier come on to replace Thompson. Twelve minutes before Full-time, the Blues finally made the breakthrough as Fleetwood was sent clear down the right hand side of the box and squared for Conor McDonagh to tap home. It was an almost identical goal to the one scored at Staines on Saturday. Less than a minute later, McDonagh repaid the favour, wriggling free through a couple of defenders before rolling the ball across the area for Stuart Fleetwood to curl home into the top corner from 10 yards. The away side then managed the last ten minutes extremely well, slowing down the game and continuing to dominate possession. Fleetwood then volleyed over the bar in injury time with pretty much the last kick of the game.